Don’t Let Stress Get the Best | I'm Skinny, Now What? I’ve had a lot on my plate in the past couple of months. I’ll share the details in a coming post, but know that the stress has been wearing me out. One of the big negative effects of stress is overeating. My version of this is eating too much of the wrong thing, namely Talenti Southern Butter Pecan. Have you had this? It’s quite possibly the best butter pecan I’ve ever had. It’s so creamy, not too sweet and with the right amount of caramel to not seem overindulgent. Plus, Talenti only comes in 1-pint containers. That’s just two cups. You get more than that in a sundae at Baskin Robbins. I’m aware that this is just an excuse, but sometimes life is like that. I was irritable, and instead of working out my irritation with a workout, I took it out on a pint (or five) of that delicious Talenti. The irritability, along with overeating with a dash of fatigue, added up to more weight than I’d ever like to see again. I wasn’t far from what I weighed when I moved to New York. That was not where I wanted to be. Stress does more than affect you physically. It’s a mindfuck. Your brain starts going a million miles an hour picking apart all the things that are wrong. You’re so focused on everything that’s not going right that you’re not looking for solutions. So you retreat to the things that aren’t stressful. For me, it’s gelato…or goldfish crackers…or Netflix marathons. At the time I was focusing on the the stress and not the cause of it. 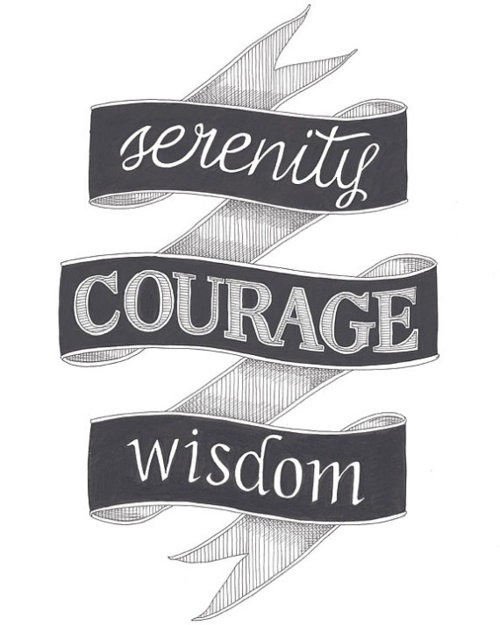 I’m a huge fan of the serenity prayer. “Lord, grant me the serenity to accept the things I cannot change, the courage to change the things I can, and the wisdom to know the difference.” I think in my period of doubt, I forgot that. I forgot that I can’t change everything, nor should I try. I needed to focus on the things I can control instead of letting those things control me. Once that clicked, I ate my last pint of Talenti (you can’t let good stuff like that go to waste). I went to the grocery store and started planning my meals again. I went to the pool for the first time in a couple of months. I even ran, though my knee wasn’t too happy about that. I took over what was in my control and the result allowed me to see better what was really stressing me out. I could pinpoint what needed to be done and take action there. Sitting on the sidelines of your life while the world is stressing you out will only bring you more damage. Take control of the the things you can and work toward a solution on the things you can’t. Being proactive in battling your stressors will lessen their effects on you in the long run. What do you do to battle stress?